"Not in vain, just a few days after the sentence was handed down that convicted the worst killer of all killers for the crime of genocide, the earth trembled in Guatemala; the earth shook because she knew that impunity had not yet been overcome: the earth shook with rage, and rightly so." The revered Latin American writer Eduardo Galeano wrote these words a few months after the events he alludes to: On May 10, 2013, 30 years after the crimes were committed, former dictator General Efraín Ríos Montt was convicted of genocide and crimes against humanity against the Maya Ixil population and sentenced to 80 years is prison. Ten days later, pressured by recalcitrant sectors of the military and the economic elite, fearful perhaps that the newly muscular arm of the law might reach out to touch them, the Constitutional Court ruled to send the trial back in time, effectively nullifying the verdict. It was a split vote, 3-2; two of the judges, as well as constitutional experts and human rights lawyers, convincingly argue that the Court had no business intervening at this point in the legal process, and that its arguments were tendentious. It was, for all intents and purposes, a judicial coup d'état. As an observer to the genocide trial, I was profoundly moved to see and hear the victims of Ríos Montt's genocidal scorched earth campaigns, silence by years of terror and fear, testify in open court. They spoke plainly and forcefully about the horrifying crimes to which they, their family members, and their neighbors, had endured. Men and women, children when the atrocities occurred, testified that they watched as soldiers butchered their parents before their eyes. Women, their heads covered in the colorful traditional weavings of their communities to protect their identities, spoke of gang rapes committed by soldiers. Others told of how they were forced to abandon their homes to escape the military rampage, how they fled into the mountains where they lived for years under constant threat of capture, starvation, death. Based on the witness testimony, expert reports and documentary evidence presented by the Attorney General's office, the trial court found that during Ríos Montt's rule, the Guatemalan state's official policy was to exterminate its indigenous population in the name of national security. U.S. scientist Patrick Ball, who testified in the genocide trial, affirmed that during this period, the Guatemalan army killed indigenous people eights times more frequently than non-indigenous people, revealing the genocidal nature of the military campagns. After reading the verdict, presiding Judge Yassmín Barrios remanded Ríos Montt to prison. This was an earthquake of massive proportions, the first time a high-ranking military official was being sanctioned for grave violations of human rights in Guatemala. The first time ever a former head of state was held accountable for genocide in a domestic court of law. Guatemalans I spoke to in the weeks and months after the verdict was overturned demonstrated a remarkably placid response to the Constitutional Court's ruling. "We are not surprised," remarked Juan Francisco Soto, executive director of the Center for Legal Action for Human Rights (CALDH), the organization that provided legal representation to the victims in the genocide trial. "That is the way things are done in Guatemala. What is surprising is that we were able to bring the case to court and see it through. We proved in a court of law that there was a genocide in Guatemala." The verdict was overturned, he noted, not by virtue of legal arguments or evidence, but by dirty legal tricks. "For us," he says, "the sentence is still valid." Moreover, says Soto, the genocide trial and verdict holds meaning for Guatemala's struggle against impunity far beyond the legal dimension. The mere fact that Ríos Montt, Guatemala's most feared dictator, faced criminal charges for genocide was seen by victims as a political and historical triumph. By bringing the case to the Guatemalan courts, the victims affirmed their rights as citizens to access justice. This is of great significance, given that the vast majority of victims of Guatemala's internal armed conflict are indigenous Maya who have been historially excluded and marginalized by the Guatemalan state. The fight against impunity for war crimes in Guatemala has also inspired broader citizen demands to end impunity for other types of criminal activity carried out or condoned by government officials. The massive anticorruption protests that erupted last year--and that resulted in the deposal of sitting president and retired army general Otto Pérez Molina--are inextricably linked to the long-standing efforts of victims and their civil society allies to end institutionalized impunity in the genocide case and other instances of human rights violations. For it is in this nexus of institutionalized impunity, born of a counterinsurgency war steeped in Cold War logic that survived after the Peace Accords and morphed into new structures of criminality, that the official corruption that ordinary Guatemalans took to the streets to protest last year solidified itself. In the meantime, demands for justice for conflict-era crimes continue unabated. Earlier this year, in a stunning illustration that Guatemala is determined to challenge impunity for past crimes, the Attorney General's Office arrested 18 high-ranking military officers accused of a series of war-time human rights violations. And in February, two military officers were convicted for sexual violence and domestic and sexual slavery in the landmark Sepur Zarco trial. Where does the genocide trial stand today? The retrial of the genocide case appears to be hopelessly deadlocked. 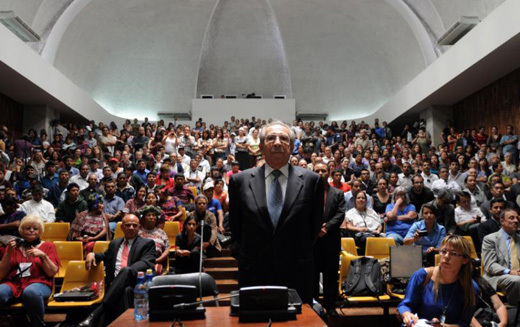 The first retrial attempt in January 2015 collapsed after two of the three judges accepted the motion presented by Ríos Montt's defense lawyers to recuse the presiding judge because she had written her thesis, years ago, about genocide. In the meantime, Ríos Montt was found to be suffering from dementia. In August, the court ruled that the trial could continue, but under special measures that would be held behind closed doors and did not require him to be present. If found guilty, Ríos Montt would not be sentenced, though he could potentially be remanded to a psychiatric hospital. The plaintiffs had little choice but to accept this decision. However, they argued that the court should separate the case against the other defendant in the case, Ríos Montt's chief of intelligence, José Manuel Rodríguez Sánchez. Not only did Guatemalan law demand that he be tried in open court; it was also a right of the victims and of society at large to witness the proceedings. The retrial was again postponed, until January 2016. That was also frustrated when the court decided that it would not start until this and other appeals were resolved. It thus came as a surprise when, on March 16, though the appeal decisions remained pending, the same court decided to start the proceedings. The judges then ordered the public and the press removed from the room, and the hearings continued behind closed doors for the next several weeks. But the trial was again suspended last week after an appeals court agreed to hear the arguments of the plaintiffs to separate the proceedings against Ríos Montt and Rodríguez Sánchez. They argue that the court's decision to prosecute Rodríguez Sánchez under the special security measures adopted for Ríos Montt due to his dementia is illegal. A decision is pending as of this writing. The legal morass thickens; perhaps this was the intent all along of those who opposed the proceedings, those who feared a guilty verdict for genocide would stain Guatemala's international reputation and embolden indigenous communities to demand their rights, especially now given the growing conflicts over the exploitation of natural resources in their territories by transnational extractive industries. The process has been frustrating for victims, who say they feel like they have become pawns in a larger political game. Yet most of them say they are not giving up their demands for justice. For them, the verdict handed down three years ago finding Ríos Montt guilty of genocide retains important political, symbolic and historic meaning. This is what they will celebrate this weekend as they gather in Nebaj, Chajul, and Cotzal, the three corners of the Ixil region, to commemorate the verdict and renew their energy to continue the battle against impunity. A battle that is just beginning, and one in which the international community will continue to be a critical actor. But it is a battle that Guatemalans are waging on their own terms, peacefully, publicly, and with enormous dignity. It is an example the world should watch closely.